Back to the Beginning at Gateway: Mothers Day!! The most important thing in this post is this “Happy Mothers Day” to our moms. Jason and I have not been with our moms for the last few years because of this race weekend We feel bad and miss our moms, but understand that we love you more then we love racing. Thank you for letting us do this. It should also be noted that Jason’s birthday is on the 15th, he still can’t drive a car but drives faster then I do. The Last race weekend we were the best prepared we had ever been. This weekend we where the worst. Worse then our first road race ever which was also at Gateway Motorsports Park. The sprint kart was just about ready, just change the motor, clutch, axle, wheels, and mount new tries. The road kart was another matter it also needed a motor, clutch, new tires, plus generally inspected and cleaned up. It also need to weight #370. This meant we needed to add ~#50 of lead weight to the seat. We made as much progress as we could in the short time working into the dark in the driveway every night. We still needed to get motors and tires at the track on Friday. The Hoosier R60 tires for both karts, were attained quickly from TJ of Winning Synthetics, with lots of time to mount them Friday evening. Our 4 Cycle Central motors would not arrive until 11:30 PM Friday, by that time I was to tired to do any more work. Saturday started very early with preparing and mounting the motors. There was not time for breakfast or coffee, just get busy. We managed to get the road kart ready for practice at 9 but the breaks where still weak, so adjustment was still needed there. The sprint kart came off the track from practice early with the engine burping, which led to carburetor adjustment and finally a good cleaning. The rest of the morning was spent making adjustment and chasing gremlins until the noon lunch break at which point we were finally ready for racing and the karts felt good. It was a long hard mornings slag to get things to the point where the karts could be raced and even then they need adjustment to make them fast. The sprint kart racing was not very exciting as the class is just him and the other classes in the race were are also small. However, he did use the time on track wisely by exploring the track surface and testing new racing lines. 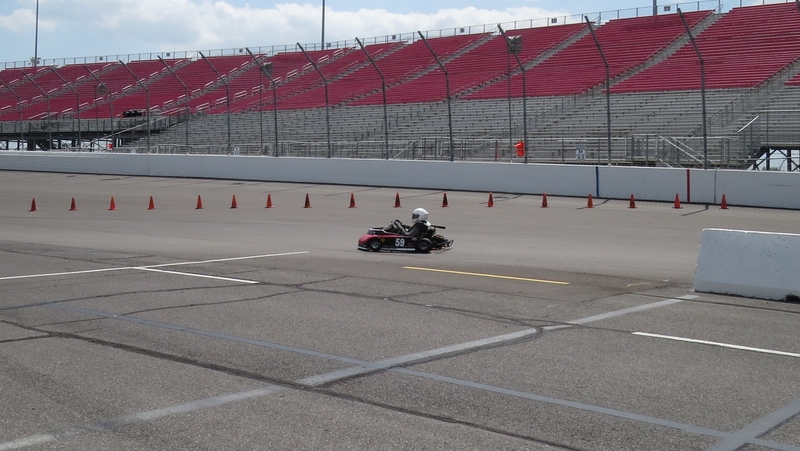 Its cool how he can still run at speed but still put the kart almost anywhere on the track he wanted too. I forget how much seat time he has has and how much racing wisdom he has collected over the years. The road racing was great! Jason was introducing Animal 370 Junior class this weekend. It is the same as the Senior class but scored separately and he will always start behind them. 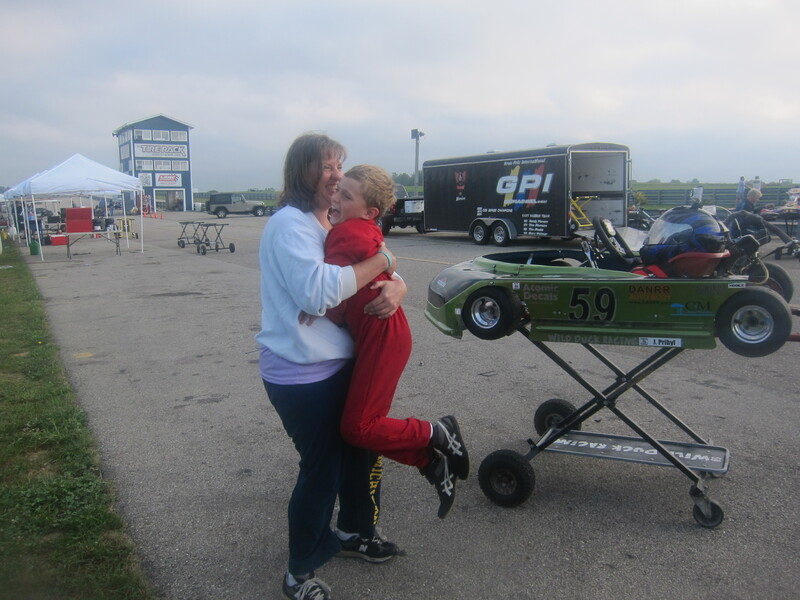 He was able to race with the guys he has been looking up to for the last 7 years. During all the races, Jason found his spot mid-pack as he raced hard and learned a lot. He finished 6th and 5th on Saturday. On Sunday the track got slick and we had trouble adjusting so he finished 7th and 8th. He received lots of compliments and raced like he belong with them. Picture from Nvus Images of the racing this weekend. This weekend we had some great company with my Uncle Mark joining us and finally getting to see a race. Over the last 7 years of visiting the track he has never watch Jason race due to scheduling, technical issues, or tornado. Thanks to Jack, Keith and Reagan at 4 cycle Central for all the help this weekend, your advice was invaluable. The next race is with Dark Kart Club at Michigan International Speedway, we missed this race last year due to injury but look forward to getting back to do another Indy and NASCAR track. Just need to remove some weight and put the restrictor plates back on the carburetors.